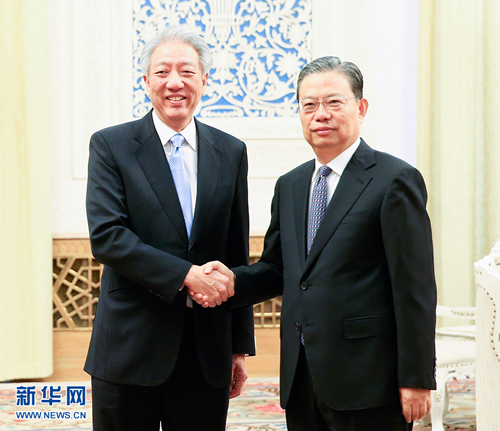 On April 11, 2019, Member of the Standing Committee of the Political Bureau of the Central Committee of the Communist Party of China (CPC) and Secretary of the CPC Central Commission for Discipline Inspection Zhao Leji met with Deputy Prime Minister Teo Chee Hean of Singapore at the Great Hall of the People. Zhao Leji expressed that China and Singapore are friendly neighboring countries. President Xi Jinping paid a state visit to Singapore in 2015, and the two countries established the all-round cooperative partnership progressing with the times. In recent years, the two sides have continuously deepened cooperation in various fields, actively promoted the construction of three platforms including connectivity, financial support and trilateral cooperation under the framework of the Belt and Road Initiative. The two countries have created two highlights of cooperation including the New International Land-Sea Trade Corridor and the third-party market to add new connotations to China-Singapore all-round cooperation. The Belt and Road Initiative has brought great opportunities to China-Singapore relations. The Chinese side is willing to work with the Singaporean side to deepen practical cooperation in areas including economy, trade, finance, law enforcement and security, social governance, talent training and anti-corruption, in a bid to push bilateral relations for greater development. Teo Chee Hean said that Singapore is willing to further enhance the integration with the Belt and Road Initiative and other development initiatives proposed by China under the guidance of the leaders of the two countries to push bilateral practical cooperation for continuous and new progress.